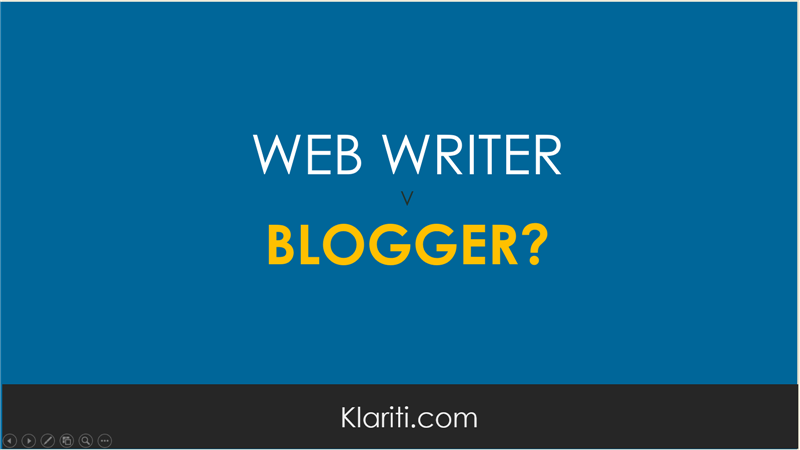 Do you consider yourself a web writer or a blogger? Is there even any difference? I suspect for most people it means that same thing, but I’m not so sure. I asked a blogger here in Dublin if he saw himself as a writer who blogs, a writer, or a web writer? Or was I just splitting hairs? What’s the difference?, I asked. Web writing is structured. Start, middle, and end. Web writing is part of a larger process. For example, she writes a series of online articles that feed into a hardback publication that will appear later in the year. Web writing has long-term goals. I think she meant evergreen type content, ie materials that will be of use in five, ten years. Web writing is stricter, ie web writers know how the rules of grammar and when to apply. Web writing has greater depth. Web writing is created by professionals. Blogging is often snippets, fragments, and less formal. Blogging is of the moment, ie more reactive. Blogging is slightly superficial. There is less analysis, research and statistics. Bloggers are (mostly) amateurs. And those who succeed soon morph into mainstream publishers, eg writing books that sell in the high street. I think I know what he’s getting at. If you’ve spent four years in university learning the finer details of language, composition, and structure, it can seem rather unfair when someone with none of this skills, starts getting more hits, traffic, and success with their site. Blogging is meant to be less formal, more in the moment, and social. You can’t have a blog post go through editorial reviews and get it online within minutes. It’s one or the other. The Daily Mail online is a good example of this, generating oodles of content every day. Not all of it gets proofed or sanity checked. But the model works. What would you suggest to someone who has developed ‘traditional’ writing skills, say a degree in English, and feels under threat from bloggers?